(CHOIVO CAPITAL) The Art of Trading (DAYANG) Profitably Around Mr Koon Yew Yin and Mr Ooi Teik Bee. First there was the boom and bust of export stocks. Though to be fair, its not that bad of a bust as the earnings were resilient, due to Malaysia having a decent cost based globally for those items as well as large supply of rubber trees. Then there was the steel boom and bust. After that was the construction boom and bust. And in tandem, the semiconductor and testers boom and bust. And finally there is the Petroleum Refinery boom and bust. This one was pretty interesting. And now with the bear market behind us, dead cat bounce or not, we’ll soon find out. We find ourselves welcoming back Mr Koon Yew Yin and Mr Ooi Teik Bee to I3. Well, neither of them need any introductions. When it comes to KLSE small caps, there is no larger market force than these two individuals, and their followers. Forget EPF, Tabung Haji etc, they are small fry when it comes to these two gods of the small to mid-cap stocks. For Mr Koon, after his RM64 million loss and the sale of his prized lands in Ipoh (from what I heard), he is back with a vengeance and making full use of the special characteristics of the KLSE markets. Understanding Koon Yew Yin, The real enigma. As for Mr Ooi who only posted a small loss last year, with the jump in small caps, the animal spirits are back in the KLSE retailers, and the pain of 2018 long forgotten. With technical breaking SMA20 or 69 or 100 (I honestly have no idea), the recommendations to private followers are back in earnest. When it comes to trading profitably around these two market forces, its important to identify the phases of the, well, frying. I wish i could think of a better and more polite word, but, if it looks like a duck, swims like a duck, and quacks like a duck, then it probably is a duck. They all have different characteristics, and the shifts are gradual, like the boiling of water, and a “Grand Ah-Whoom!” moment at the end. I’ll explain that phrase later. You will not see KLSE raising up a sign when things shift into different phase, but i hope this article will you help you identify roughly the phase you’re at. Depending on which phase you are at, the things you need to do, to notice, and the risk involved is very different. For the sake of simplicity, we will split them into 3. “The Beginning” , “The Middle” and “The End”. They usually start the same way. A company has about 2 good quarters. The company was in the doldrums before this and at a cyclical low, or somewhere near that price. Coupled with the 2 good quarters, is a story that explains this increase in profit in a believable manner. In this case, its that PETRONAS having higher capital expenditures, which should and did increase maintenance works. For the case of DAYANG, its also coupled by a very nice, detailed and long report from RHB on the industry, which helped to provide the background for the story presented to the public. With this story in mind, they extrapolate the now to the future, and thus infer that results will be far better in the future, and therefore an increase in valuation is in order. Mr Ooi, only announces it to his private subscribers. However, Mr Koon Yew Yin will announce publicly he is buying as his goal is to help you make money and teach you investing. Obviously! No reason to doubt that. Now, this is the point where you need to jump in fast, especially if he says Mr Ooi is recommending it as well. Check the forum comments, if Mr Ooi recommended it, you should notice an uptake in the number of comments as well as the level of enthusiasm. If you’re lucky, it may be sometime before the quarterly results, in which case, you have a nice long wave to ride before the quarter. Before the quarter hits, you will need to do your own expected value calculation. What kind of profit the market is pricing in? Better than the previous quarter as well? What are the probabilities and outcome for each scenario? This means that all outcomes considered, this has a positive expected value of 7%, in which case you should hold. If the quarter was bad, there is a good chance that the story ends here. In which case, sell and wait for the next one. If the quarter is good, you can now enter the middle phase. The thing you need to know here is this, Mr Koon and Mr Ooi, along with all their immediate followers will now proceed to sailang. However, they or their members will be a little hesitant unless the price were to start going up significantly. There is no need to fear much here, because Mr Koon usually buys in an extremely aggressive manner which will instantly push up the price. You will have until next quarter to ride the wave, assuming nothing unexpected happens. As Mr Koon and Mr Ooi buy very aggressively, along with their direct followers which are often quite rich as well, you should see an strong inflation in price. It is around this time, that the average market participant should start to get itchy and join as well. And as the price rise further, the more conservative ones will not be able to tahan, and join as well. At the same time, some fund management money will also start flowing in as its a big catalyst event. They too intend to ride the wave and make some money from the more foolish retailers. "How much money does Mr Koon have left?" This is the amount that he can use to further push or support the price. This amount is also a decent proxy for how much money Mr Ooi, his followers as well as Mr Koon’s rich friends have left. When he says he has a lot of shares and don’t need your support, its more than 50%. Every subsequent time he releases an article, add 5%. Occasionally, he may even tell you the actual figure, by being a 5% member. However, after his loss of RM64mil, and assuming a margin limit drop of at least RM64mil as well, I don’t think he may appear again unless the company has market capitalization of well below RM1 billion. This stage is where both people as well as their direct followers are all pretty much all in. Or at a point, where they just can’t stomach putting more. I will describe it using two perspectives, “Diversity of Participants” and “Valuation”, as they are quite key to understanding how all the stages tie up, and also conveniently describes how the final stage ends. Every market or individual stock is a complex system that is typically filled with a diverse group of participants who are irrational in one way or another. They consist of people having different ideas and different views of things. Long term, short term etc etc, and all these individuals are a little or very irrational towards one end or the other. The long-term investor may decide not to trade even though it may make sense for this quarter, allowing the trader to trade and make that profit. The trader’s inability to sit still and hold, allows the long-term investor to buy it from them and hold it, making the money from the long-term growth of the company. Etc etc. Despite the irrationality of their participants, their diversity ensures that they are all irrational in different directions, giving a net effect of zero, allowing the wisdom of crowds to prevail over the long term. As you slowly remove diversity, nothing happens initially. Additional reductions may also have no effect. But at a certain critical point, a small incremental reduction causes the system to change qualitatively. This results in the shares being quite undervalued, as the people who were trapped don’t want to top up and the cyclical value investors, are there by virtue of their cheapness. As the boom rushes along, the “Cyclical Value Investors” and “People who become trapped” becomes increasingly smaller portions of the pie, especially as the retailers (foolish and shrewd) and fund money looking to ride the wave come in. It is around this point, as the price climbs higher and higher into bubble territory, that the fund managers and shrewd retailers start selling. Growth investors may start selling as well. Population diversity falls, invisible vulnerabilities and risk start to build despite the price constantly marching upwards. This is the point at which you should be selling, assuming your are a KOONBEE Trader, never chase the last dollar. Except, every single one of these participants use extremely similar trading strategies, and as they keep buying, their common good performance is reinforced. This makes the population very brittle, and a small reduction in the demand for Dayang shares could have a strong destabilizing impact on their prices. It is at this point that risk is at absolute highest. As most of the market participants have the same strategy, in the event the thesis, or in this case, the results are not as strong as they expected, or worse, a loss. Its not just some of the market participants who want to sell, but, ALL OF THEM. And as prospective buyers are likely to be market participants with similar trading or investment strategies, demand dries up instantly as well. "When everyone in the stock cannot think of even one bad thing that will happen, or about the company, and the comments all sound the same." In the meantime, if the result was good, it will not increase by much as everyone who wants to buy the stock already has it, and has exhausted their cash and credit lines, unless it’s a very fantastic result like HengYuan. In this case the expected value calculation is highly negative, it probably looks something like this. 20% Chance of good enough result: Up 5% up. This means all outcomes considered, this has a negative expected value of 19.5% in the first day. Its likely to fall further as people sell. Often as Mr Ooi is quite shrewd, he would have sold a large portion of his position as prices go up and inform his followers. This is where you may see some “consolidation” in terms of chart movements, which is where Mr Ooi, Mr Ooi's direct followers, shrewd traders and fund managers are transferring their shares to the foolish retailers. Mr Koon on the other hand, often considers himself an investor, and thus will hold on longer, or wait for margin calls to force him to sell. Having said that, given that he was burnt properly 2018, he is likely to listen and do exactly as Mr Ooi tells him to, at least until his profits make him feel like he is smarter than Mr Ooi again. While the foolish retail participant who is in reality, a trader, but foolishly considers himself an investor, makes the fatal mistake of averaging down, often on margin. Turning a bad trade, into a mediocre and at times fatal investment. Soon, diversity returns, and the foolish retailer, turns into people who are trapped. And as prices fall further, with the cyclical value investors return. So how did the shrewd investors, fund managers and to an extent Mr Ooi or Mr Koon know when to sell? In the case of Mr Ooi and Mr Koon, its also because they are the first movers and catalyst. The intrinsic value of an investment is simply all future cashflows discounted back to present value. However, when a “Target Price” is set in these scenarios, Mr Koon for example, just takes the forward earnings, which is often at an all time cyclical high, and multiplies it by 10, for a TP of RM2.24 or something. This does not consider the resilience of the earnings, or the capital structure of the company. 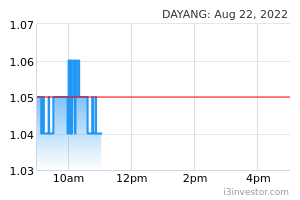 In this case, The Enterprise Value (Market Capitalization + Debt – Cash) of DAYANG is roughly RM2.4 billion. Even when the current all time high earnings (which includes a ton of write backs of impairments/allowances as well as forex gains) is used, roughly 14 years is needed to see a return on investment, or roughly 7.14% yield. Do you honestly think that, only a mere 2.49% premium from the risk-free rate of 4.65%, is needed for these kind of highly cyclical business, on the high end of the cycle and with write-back boosted earnings? Have you ever wondered, why Mr Koon when presenting his track record at investment forums, only shows the first half of the chart? Hint, the share does not stay at that price, a sea of fools paid for it. For those people, it would have been better if the price had not risen at all. Reading the comments here, people here like to quote the RHB report verbatim, stating that PETRONAS will have higher capital expenditure, and therefore have a greater need for an MCM provider, which DAYANG can provide. Well, do note that back when oil prices was USD100 or so per barrel in 2014, when Petronas pays for MCM, their goal is to produce as much as possible. MCM companies could basically quote any price they want, especially if they were good. So what if it cost PETRONAS an extra USD2- USD3 per barrel? They were making at least USD40 per barrel. Forget about it, let you make a bit lah! However, today the situation is vastly different, oil prices are about half at USD50-USD60 and highly volatile, with future outputs from US shale constantly increasing. PETRONAS will fight with you like dogs over the price. From talking to my friends in PETRONAS and petroleum consultants, if you can even get a 10% net margin, you’d be breaking out the champagne. In addition, do note current revenues and “earnings” are higher (or close to) than 2014 and 2015, when PETRONAS had their highest capex ever, and paid golden mountain prices for good MCM works. A few slightly more, i hesitate to use to the word “insightful”, people, may then point towards the RM3 billion order book and say earnings for future years is guaranteed. May I also point out that just before they started losing money in 2017, the order book was also around RM3 billion? And that the order book was around that figure every quarter they made a loss? Which also goes for the tenders and their quantum. I doubt Mr Koon or Mr Ooi genuinely thinks its worth RM2.24 per share. That if they actually had the money, they would privatize it at that price. And neither would the shrewd traders, or any investment manager in a fund worth half their salt. The foolish retailer on the other hand, really do think identifying the intrinsic value of a company, is as simple as taking the forward/ current earnings, which is currently at an all time high, and multiplying it by 10. So, the million-dollar question. Talk so much, got buy anot? Not a single cent! Hahaha! The only one where, i might have considered an error on my part was CARIMIN, and to an extent NAIM. I saw it at RM0.2X and RM0.4x or so. And as they had a pretty good balance sheet and pretty damn cheap, I figured it would be worth a cyclical/net asset play and was thinking of a 2-3% position. Does the balance sheet have low leverage? Is the downturn cyclical or permanent? However, I decided against it in the end, as they were better opportunities then that were within my circle of competence. Still wish i bought like 1- 2% at least though!. To be fair, I did not even really read the prospective statements as I wasn’t that keen on it. If i had, i may have made that 1-2% buy. And this was despite having friends in Petroleum Divisions of Consulting Firms, as well as PETRONAS, who told me capex works are picking up in 2018. Oh well. What about my 500% trader friend? For more info on this fellow, read below. Conversation with a top tier trader, and lessons learnt. He bought and made a ton of money. Hahaha. If it was another value investor who was friends with him, the fellow may have lost alot of money, being tempted into doing things he has no skill nor business doing. I must admit, from my previous observations of the same scenarios, and as i looked at the meteoric rise of DAYANG, as an un-involved third party. I was quite tempted. However, I don’t think this is my money to earn. So, which phase are we in? Well, my 500% trader friend, who trades like a young George Soros, has sold off most of his position. PS: By the way, in the event Mr Koon and Mr Ooi reads this and decide to change the way the do their trading, what you need to do is likely to change somewhat. Heavenly PUNTER Still no end, what is going to happen today? Thank god and I am glad that the war of word is over and peace and reasoning prevail. No one going to jail and I am looking forward to read Philip, Jon , Icon8888, Kcchong and many other Sifu’s articles and comments in I3. I had to salute Mr. Koon’s magnanimous in only blaming himself and no other for his losses in JAKS. Everyone should know that it was quack quack quack misleading Koon astray and even “Batu Api” to the extent that at one time Mr. Koon is not in talking term with Mr. Ooi. I am very happy and glad to see Mr. Koon and Mr. Ooi like abang-adik during the Investment blogger day. Let bygone be bygone and seize today opportunity to make your intelligent and informed investment. P/S: Nowadays we type faster that what our brain can think properly hence we tend to be rude, arrogant, provocative and sarcastic when making comment. Thus I would like to make a personal sincere apology to Mr. Philip for my many sarcastic and rude comments on you. Let’s befriend each other. Similarly Mr. Koon like to write provocatively but in life he is a very gentle gentlemen when talking in person. I miss the good old day when he use to send me many interest article from Babamail but I ask him politely to exclude me from his mail list because I do not want to be group with quack quack quak. My profound apology too to Mr. Koon for writing an article in i3 blog that hurt him so much. Choivo Capital Yes i am aware of this method. Its an investment partnership type co. The same used by Li Lu, Buffet in his early days, as well as Mohnish Pabrai. I was thinking of this type of structure, 3-5 years from now if my track record is set, as the requirements to do fund management activity in malaysia is very stringent, and with high barriers of entry. It would be a quite of a compounding and performance miracle for me to turn the few hundred k i have now into 5 mil required by SC, in 3 years. Nice to know we are not going to be cellmates. (S = Qr) Philip FYI this only works if I don't have to take money from the public, the investors/partners are clearly stated, percentages fixed. We are all partners in the company, wth me as technical manager. qqq3 and as for this sslee, I think he need a psychiatrist. i3Value Choivo, you are stubborn like cow and immature. Moral of story is dont do what you not qualified to do. Are you qualified? No. You got license? No. You go work on your license and then you do this business. Not work around the legal system now. You put the problem as RM5m capital. That is wrong thinking. If you have qualification and license, plenty people will invest in this type business. The reason the capital requirement high is to protect investors so that the company is not fly by night company. Why you cannot get license now? Because you dont have practical experience. Read books is not experience. Know theory is different from real world. But you think you smarter than everyone else so you should be different. Close your business now. If you really want to do this business, read the requirements again. And work towards meeting all of them. Right now you are an illegal operator. Nothing more than that. Continue this business now and if you get into problem, nobody will pity you. You know very well you are trying cheat the system and law. Yes i am aware of this method. Its an investment partnership type co. The same used by Li Lu, Buffet in his early days, as well as Mohnish Pabrai. No point being a fund manager or getting license damn waste of time with so much restriction loh...!! U R better off doing like Philip do, borrow from family members and close friends and relatives and use bank margin and do the investment all by yourself loh....!! And Start buying into Sapnrg cheap b4 too late, it is one of the way increasing ur networth exponentially and steadily & safely...trust me...this is a very good investment for upcoming young industrious cikku like U mah.....!! Please check it out and don miss this golden opportunity loh....!! If u can grow ur networth to say Rm 50 million....perhaps u can set up a stock raiding co....and get it listed in the leap mkt 1st....raider promise to put some monies in your listed vehicle loh...!! At this point u can be the managing director of stock raiding co loh..!! Choivo, you are stubborn like cow and immature. Moral of story is dont do what you not qualified to do. Are you qualified? No. You got license? No. You go work on your license and then you do this business. Not work around the legal system now. iamnew GO READ about the license from the SC handbook and the law. Its not Grey just not enforce, just like IB, Corporate Advisory License and Research analyst license is not the same. The exam modules are different. AS well as the scope. In the whole world the concept of remisier only happens in Malaysia. No other country has it. Its an old license. Powers of remisier was very broad previously. Remisiers could obviously give advice to clients and also prospective clients (this is important and has strong legal implications). Paying a Remisier for advice is obviously not illegal per se. SC hands are tied coz obviously its black and white ok in the old days. Its a grey area nowadays. Authorities believe that if it is a Grey Area, they will give you the benefit of the doubt. As such SC will not take any action against any Remisier for a) advice to clients and prospective clients and b) getting paid for advice. ONLY manipulative actions are prosecutable. Sapura Energy was testing the RM0.33 level in its latest session. With a healthy RSI level, a bullish bias may be present above this mark with a target price of RM0.365, followed by RM0.38. Meanwhile, it may continue moving sideways if it fails to cross the RM0.33 mark in the near term. In this case, the immediate support is anticipated at RM0.305, whereby traders may exit on a breach to avoid the risk of a further correction. RAIDER VERY SPECIAL VALUABLE ADVICE, THE BEST MONIES ARE MADE BY JUST SITTING, THUS JUMP IN SAPNRG WHEN IT START MOVING, AND SIT ON IT FOR 3 YRS AND 3 MTHS AND THE CHANCES OF U GETTING RM 3.00 ON SAPNRG IS HIGHLY LIKELY LOH........!! DO NOT SETTLE FOR TINY SMALL TRADING PROFIT AND THINK BIG AND BE SMART AND BIG MONIES START FLOWING IN MAH. stockraider DO NOT DESPAIR IF SAPNRG JUST SHOOT UP LOH...!! Sapnrg long way to go ....the coming turnaround will be very strong loh...!!" qqq3 and as for trading buy, Perdana, son of Dayang is faster running horse. (2.6m shares buyback April ) Philip Times 10 in 3 years hahahaha the next Amazon! I also got Perdana.....all cigar butters. after the MCM ( maintenance, construction and modifactions) results were out, it became obvious those with boats ( like Dayang ) have better margins than those without own boats ( like Carimin). I'm a pure bottom up guy, i don't take into account industry average p/e or sentiment etc. For Sapura to make sense for me, i need to see it being able to make 1.3-1.7 billion a year in profit after tax (or preferably owners earnings) reliably by the next year, and grow moving forward. I don't think that is probable. If you do, please illustrate and teach. The price however, will go wherever it wants to. Icon8888 Why does a company with RM7.8 bil market cap needs RM1.7 bil profit before it is a buy ? Choivo Capital I dont just look at Market Cap. I also look at debt. When you are in a highly cyclical industry and you have a lot of debt. Things can get very interesting. I won't accept 10% earning yield (earning over PE). I need at least 17-20%. Because the next 10 years is so cloudy. However, people do tend to think fair value is roughly 10 times PE regardless of capital structure. So if you are aware of this, there is some intelligent speculative money to be made. Choivo Capital If it earns at least around 10% of enterprise value, ill take a look. stockraider THE ROUTE TO TIBET....COMES WITH U MAKING THE 1ST STEP LOH...!! I go at it with a very owner perspective, as if i actually have the money to privatize it. Now they are exceptions. If the debt is non-recourse debt, ie ring fenced to certain assets. Then its a different story. In this case, the risk is all passed to the bank, and i get the free money, as long as i meet certain financial ratios as per the loan agreement. Choivo Capital Raider, i doubt the turnaround will be strong enough for me to justify paying that for the company. However, there is a good chance it will be enough for many and push the price up. I dont invest based on what i think other people will think its worth. I'm stupid like that. stockraider DON LISTEN TO THE RUBBISH PHILIP COMMENT ON HIS HIGH DEBT YINSON ON RING FENCE HIGH DEBT RUBBISH MAH....!! NOTHING CAN SHIELD U FROM HIGH DEBTS, UNTIL AND UNLESS U EMBARKED MASSIVE MONEY MAKING BUSINESS PROFIT AND CASHFLOW EXPANSION LIKE WHAT SAPNRG DID LOH.......!! Non-recourse or ring fenced debt means. It is tied to the asset. If i cannot pay, you just take the asset. You wont chase after me. If its recourse. If my asset not worth enough after auction, you can still chase me! Either way, if you screw up to the extend that they need to take the asset, you are probably not doing well. But imagine if HYFLUX got a ring fenced debt agreement for their TUAS water plant. In that case, bank bankrupt, not them. stockraider Once u have non recourse funding, it will mean higher interest rate or u may even end up not getting enough & type funding u want loh...!! Why the bank think that way ?? 1. Very obvious mah...the bank is not expert in your business...if u want non recourse lending....the bank will ask u to provide more skin in the game, like u putting up 50% to 70% of equity and the bank will fund the rest loh...!! 2. As for interest rate, it will be higher bcos this will mean higher risk mah....! Nothing is free...if u want the bank to take more risk u pay loh.....!! Yes, however if sapura had ringfenced funding, by now share price still RM3-4. I don't know, up to you. I just cannot buy, you however can. I hope you make money, ill just study/buy opensys more. 3iii Don't worry about missing the Next New Thing. Avoiding mistakes and danger zones is more important for long term investment performance. stockraider The company with ring fence funding is armada...just look at armada state....they are in deep trouble, even with the ring fence loh...!! Thats why when Philip says yinson ring fence....raider see craps loh...!! Difference between sapura and armada is this. Sapura question is, whether i want to go bankrupt. Choivo Capital Of course, sapura got saved by PNB so, theres that. in the mean time, people are making money in OG stocks, today, those OG shares with OSV even better....those with IPP also doing well. qqq3 forum is forum....but no OG shares can go to sleep . stockraider Raider has been talking about explosive bulls coming loh...!! someone need to distribute their shares or need help to push the share up because of high liquidity shares? tomorrow may be the same pattern, if up in the morning, sure sell off will happen. Don't be trapped!!!!! IDSS volume was very heavy..be prepared for a slow ride up. U SEE LAH....WHEN U R INVESTING RM 0.34 AND EXPECTING TP RM 3.00 WITHIN 3 YRS, WHY DO U BOTHER WITH THE TRIVIAL ISSUE ABOVE LEH ?? U R NOT GOING TO SETTLE FOR TINY TRADING PROFIT MAH....!! U JUST BUY & HOLD AND WIN VERY VERY BIG OVER 3 YRS MAH....!! BE ON GUARD ON THIS TRIVIAL AND UNPRODUCTIVE ISSUE THAT WILL DISTRACT U FROM MAKING A MAJOR KILLING IN INVESTMENT, THAT U HAVE NEVER DREAM OR IMAGINE B4 MAH.....!! JUST REMEMBER THERE ARE STILL HUGE PROFIT MAKING OPPORTUNITY COMING YOUR WAY MAH......!! stockraider U need to stick to champion mkt leader stock in the O&G industry to ensure longterm sustainability loh...!! 2. Sapnrg with Tp Rm 3.00 over 3 yrs 3 mths now only rm 3.00 mah...!! stockraider THE BEST INVESTMENT STRATEGY IS THAT U BET WITH LOW RISK AND WITH VERY HIGH POTENTIAL RETURN LOH.....!! SAPNRG IS THE BEST PICK BCOS IT MAKE ITS OWN FUTURE MAH....!! 1. SAPNRG HAS OIL EQUIPMENT N MACHINE WHICH CAN DO VERY COMPLICATED JOBS, IT IS THIS REASONS IT HAS RM 19 BILLION CONTRACT IN HAND TODATE AND THIS IS BASING ON ONLY 50% OF ITS CAPACITY UTILIZATION LOH...!! SAPNRG STILL HAS BALANCE CAPACITY TO TAKE UP ANOTHER RM 20 BILLION MORE JOBS LOH.......!! 3. IT IS EXPECTED SAPNRG OWN INTERNAL OIL FIELD WORKS CAN CONTRIBUTE AT LEAST RM 4 BILLION OF CONTRACTS TO SAPNRG PA....THATS THE REASONS WHY RAIDER SAYS SAPNRG...ORDER BOOKS IS INCREASING AND GROWING EVERYDAY AND MINUTES, BCOS OF THIS OWN INTERNAL WORKS THAT CAN FLOW IN ANYTIME LOH....!! THE BOOMING OIL CONDITIONS WILL KICK START SAPNRG RECOVERY FROM BEING A PENNY STOCKS OF RM 0.34 TO ITS RIGHTFUL ORIGINAL POSITION OF A PRECIOUS BLUECHIPS AT RM 3.00 GIVING IT MKT CAP OF RM 70 BILLION LOH...!! SAPNRG HAVE THE FOLLOWING MOST IMPORTANT ALLIES LOH...!! 1. PETRONAS ...THEY HAS AWARDED THE MOST CONTRACT TO SAPNRG COMPARE TO ANY OTHER OIL & GAS LISTED CO IN MSIA. 2. OMV ITS REPUTABLE JOINT VENTURE PARTNER..THAT INVOLVE WITH HUGE OIL EXTRACTION AND OILFIELD RESERVES ENHANCEMENT ASSETS...THAT WILL INCREASE ITS REVENUE AND REDUCE THE COST OF PER BARREL OF OIL LOH...!! 3.PNB WHICH PROVIDE CORPORATE ADVISORY, FUNDING REQUIREMENT AND GOOD CORPORATE GOVERNANCE, THUS SAFEGUARDING THE MINORITY SHAREHOLDERS. WITH THIS IN PLACE WE ARE PRETTY SURE & SAFE THAT SAPNRG WILL GROW EXPONENTIALLY AND SUSTAINABLY...THATS WHY RAIDER SAYS ALL OUT SAILANG ON SAPNRG, WHEN IT IS VERY CHEAP MAH....!! THIS WILL BE DRIVEN BY EARNINGS OF RM 3.0 TO RM 5.0 BILLION PA LOH....!! stockraider Overwhelming demand for KYY comment on dayang and carimin loh...!! Venue: Hee Lai Ton Restaurant. 274, Jalan Sultan Iskandar, 30,000, Ipoh. Ooi Teik Bee will explain his method of using technical and financial analysis to buy and sell stocks. Heavenly PUNTER really or not stockraider, it's pattern like this that will end up costing all the youngster all their hard earned money lah. I would rather pay RM1,000 attend talk by Philip anyday anytime! stockraider DO U REMEMBER A VERY OLD SAYING THAT FORTUNE FOLLOW THE BRAVE ?? AFTER RAIDER FEED U WITH ALL NAPSHOT INFO ON SAPNRG....U NEED TO BE BRAVE AND SUMMON YOUR COURAGE, TO TAKE STEPS TO BUY SAPNRG KAW KAW B4 TOO LATE..DON FORGET THEY WILL BE MANY MANY THOUSAND OF PEOPLE SLOWLY SUMMONING THEIR OWN COURAGE TO POUNCE ON SAPNRG LOH...!! JUST REMEMBER...U R VERY LUCKY...TO HAVE RAIDER IN I3 TO ADVICE U AND SHARE THE JOY OF SAPNRG AND ITS FUNDAMENTAL...VERY FAR AHEAD OF THOSE THOUSANDS OF LONELY PEOPLE..TRYING TO SUMMON COURAGE TO INVEST IN SAPNRG LOH....!! RAIDER CAN ONLY ADVICE U ON THE GOOD THINGS ON SAPNRG....BUT ON COURAGE U NEED TO DEPEND ON YOURSELF...BCOS RAIDER IS NO EXPERT TO HELP U ON COURAGE MAH......!! REMEMBER TO GO TO ROME...U NEED TO MAKE THE 1ST STEP LOH...!! (2.6m shares buyback April ) Philip I think it may be easier to teach stockraider how to think in lateral terms. If Stockraider is so adept at buying and selling stocks in the short term, I give him a chance to compare the results of his yearly investment against KLCI benchmark. This is the year on year performance ( share price turn) of the 30 biggest companies in bursa Malaysia, indexed. The local passive investing, if you will. In 2017, choivo did 12.2%, but in 2018 he had a total turnaround with -17.95% returns. Of course, if you do benchmarking, the average retirees who put money into the index made money in 2017 and lost money in 2018, so you can say the Jon choivo active management is underperforming retiree passive management. I wonder what is stoneraider year on year performance like, for him to be so confident and say sapura will be a 70 billion dollar company in 3 years 3 months. Or does he not keep track of his own investing performance, but same like Calvin tan just spout out whatever stocks he likes, but did not act on anything material? I believe 2019 will be a good year, but will you outperform the benchmark index? u understand what is long term investment or not ?? It is buying sapnrg at rm 0.30 & sitting & holding sapnrg longterm at least 3 yrs with long term tp of rm 3.00 mah...!! I think it may be easier to teach stockraider how to think in lateral terms. If Stockraider is so adept at buying and selling stocks in the short term, I give him a chance to compare the results of his yearly investment against KLCI benchmark. VenFx Why need argue ? Cant play 2 pattern in 1 same counter meh ?